Figure 1. IF results in increased activity in neurons involved in communication between the entorhinal cortices and the hippocampus, and increased neurogenesis (creation and integration of new neurons from stem cell replication) in the hippocampus. 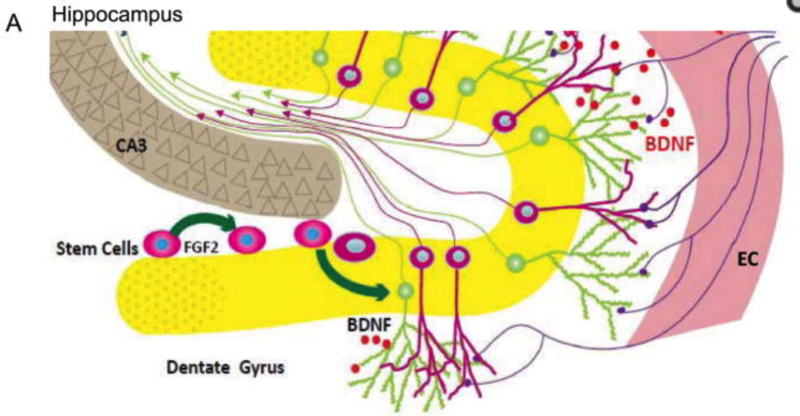 In addition, molecular pathways that promote neural health are upregualted by IF, including brain derived neurotrophic factor (BDNF), glutamate, insulin, and GLP-1 signaling. In terms of modulating mood, a 2014 study demonstrated that measures of depression-like behavior in mice, could be ameliorated by IF. And furthermore, co-administration of an anti-depressant pharmaceutical, imipramine, with IF further improved the behavioral response. Molecularly, IF and imipramine also enhanced molecular pathways associated with learning and memory. These data suggest that the powerful molecular effects of IF can have measurable outcomes on mood and cognition. Figure 2. 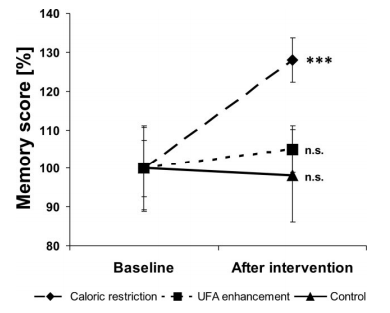 Restriction of calories results in improved memory capacity compared to supplementation with a unsaturated fatty acid diet (UFA - a diet suggested to improve memory) and control (no change in diet). Figure 3. In rats, exercise combined with intermediate fasting at every other day (EXE/EODF) was more helpful for improving short, intermediate and long-term memory compared to a sedentary lifestyle (SED), or either intervention alone (EXE, EODF). Bruce-Keller, A. J., Umberger, G., McFall, R., & Mattson, M. P. (1999). Food restriction reduces brain damage and improves behavioral outcome following excitotoxic and metabolic insults. Ann Neurol, 45(1), 8-15. Witte, A. V., Fobker, M., Gellner, R., Knecht, S., & Flöel, A. (2009). Caloric restriction improves memory in elderly humans. Proceedings of the National Academy of Sciences, 106(4), 1255-1260. Khabour, O. F., Alzoubi, K. H., Alomari, M. A., & Alzubi, M. A. (2010). Changes in spatial memory and BDNF expression to concurrent dietary restriction and voluntary exercise. Hippocampus, 20(5), 637-645.